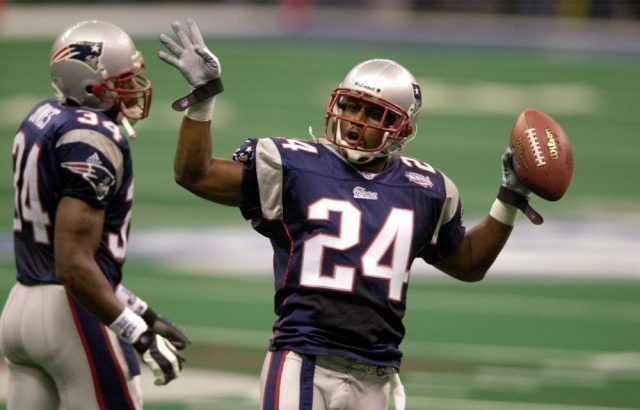 Former Patriot cornerback Ty Law has been elected to the Pro Football Hall of Fame. Law is one of a loaded 2019 class comprised of Tony Gonzalez, Ed Reed, Pat Bowlen, Champ Bailey, Kevin Mawae, Gil Brandt, Johnny Robinson, and Law. Law was drafted 23rd overall by the Patriots in the 1995 NFL Draft. Law spent his first ten seasons in New England, before leaving and bouncing around the league with the New York Jets, Kansas City Chiefs, and Denver Broncos before calling it a career. Law is a three-time Super Bowl champion, all with the Patriots. His most famous play came in Super Bowl XXXVI, when Law intercepted St. Louis Rams quarterback Kurt Warner and took it 47 yards to the house to start the scoring in the 20-17 Patriots win. In the 2003 AFC Championship Game against the Indianapolis Colts, Law picked off future Hall of Famer Peyton Manning three times en route to a second Super Bowl in three years, which the Patriots won against the Carolina Panthers. Law amassed 53 interceptions throughout his NFL career and was elected as a member of the Patriots Hall of Fame in 2014.